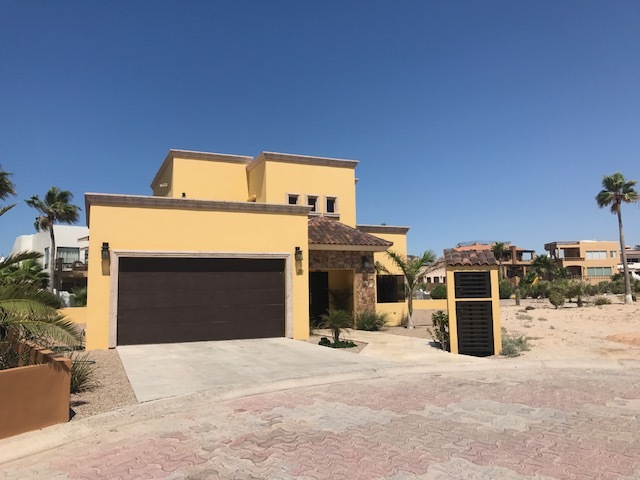 Costa Diamante is the only single residential community on Sandy Beach, cobblestone streets, underground utilities, secured entrance, community pool and so much more. Casa de JJ is located a few steps from the ocean, and has a community pool. It has 3 Bedrooms, 3.5 Bathrooms which can accommodate up to 8 guest. The home is painted a soft yellow, and has 3 terraces with ocean views. The family room of this beautiful home has light beige colored walls. The living room has two chocolate colored couches with 3 matching bronze colored cushions. The living room includes a light brown wood coffee table with 1 matching end table for the beautiful top lamp, the living room also has a 50 inch Smart Television with satellite and INTERNET. The dining room has a large rectangular shaped dark colored table with seating for seven adults. The kitchen has a beautiful Venetian gold granite counter top with ebony wood cabinets and matching stainless steel appliances. The kitchen fully equipped comes with countertop conveniences like a toaster, blender, mixer and coffee maker. You have all the serving ware and cookware needed for a nice meal while staying in this amazing home. The 1st bedroom has a king size low profile bed with an aqua colored bedding set and gray toss cushions that match the headboard. The room includes 2 bedside tables, a large flat screen television mounted on the wall, as you walk towards the bathroom there is a large closet for your clothing. The 2nd guest bedroom has a full bed with Waverly patterned bedding. The room has a large build in closet with 4 drawers and right in the middle of the closet a 24-inch television to watch a movie after a long day at the beach. The 3rd bedroom has two twin beds, both beds have high rise headboards a beautiful top lamp in the middle of each bed for this kids room and a flat screen television on the wall for entertainment. Come visit Puerto Peñasco and stay ay CASA DE JJ, it´s just a call or click away.